Description: This stamp is made by The River City Rubber Works Company. This is a large Baseball for the avid fan in your life!! Description: This wood mounted rubber stamp is made by River City Rubber Works. #1545-D Perfect for the Baseball fan or player in your life. 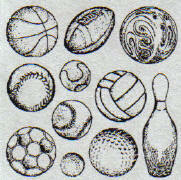 Size: 3 1/2" x 3/4"
Description: This is a collection of sports balls that are in clear stamps. It's easy! Peel off a stamp and stick it to an acrylic block! It clings! No adhesive required! Use them just like any rubber stamp! Clean it on the block and stick it back on the clear carrier sheet! This set comes with a 2" X 3" acrylic block to fit all sizes. The block is see through so you can see exactly where you are stamping! This is a great set of 11 stamps! Size: Various sizes from 1/2" to 2 1/4"